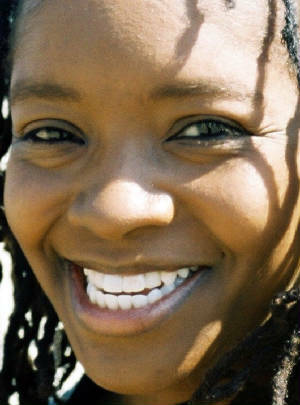 Please visit Cherryl Floyd-Miller's blog, ROOTWORK: A WRITER'S LIFE AND POETICS. "Of the many things I am - mother, daughter, sister, friend, colleague, motivator -- the role that quickens easiest in my blood is that of writer. I've been writing since I was seven. They were small poems, initially, that I kept hidden in diaries and five-subject notebooks. Now, those poems have grown up, as have I ... and I see myself making an impact across genres. I am a writer, period." Cherryl Floyd-Miller, also known by many artists simply as BLUE, is a poet, playwright, fiber artist and advocate for fellow artists. She has held writing fellowships with the Fulton County Arts Council (2004-2005), at Idyllwild Summer in Poetry (2003), Caldera (2002), Cave Canem (1998-2000), Vermont Studio Center (1997) and the Indiana Arts Commission (Literature, 1994-95). She is the first Atlanta poet to receive a Poets & Writers, Inc. Readings grant. Her work appears in MiPOesias, Poetry magazine, Terminus, Poetry Southeast, Broad River Review, Copper Nickel, storySouth, North Carolina Literary Review, Crab Orchard Review, Open City, Poetry Midwest, Essence magazine, sidereality and other literary journals. You can also find her work in these anthologies: The Ringing Ear: Black Poets Lean South (poetry, March 2007, University of Georgia Press), Gathering Ground (poetry, March 2006, Univ. of Michigan Press); Java Monkey Anthology (poetry, June 2005 & 2006, Poetry Atlanta Press);Proverbs for the People (fiction, June 2003, Kensington Publishing Company, Inc.); Mischief, Caprice, and Other Poetic Strategies (poetry, 2003, Red Hen Press), Beyond the Frontier (poetry, October 2002, Black Classic Press) and Keeping the Faith (nonfiction, October 2002, Random House). She has published two volumes of poetry. The first, Utterance: A Museology of Kin was a semifinalist for the 2001 Kathryn A. Morton Prize in Poetry and a 2002 finalist for the Naomi Long Madgett Poetry Award. Her second volume of poems, Chops, won the 2005 AIGA Gold SEED Award and is housed in the permanent collection at the Museum of Modern Art. She is also the 2006 inaugural winner of the Poetry Daily-Virginia Arts of the Book Companion Poems Contest and the 2002 winner of the Hughes, Diop, Knight Poetry Award from the Gwendolyn Brooks Center in Chicago. She has appeared on The Oprah Winfrey Show on the "Heart of a Woman" Book Club segment with Dr. Maya Angelou and received a key to the city of Indianapolis for her work as a journalist and emerging writer there. Her play Settling Sophia received its Southern premiere in the Fall of 2003 with New World Stage Theatre and its Midwest premiere in October 2004 at Western Michigan University. The play also had a 2006 run in Atlanta at the Southwest Arts Center. Cherryl's third volume of poems, Exquisite Heats, is forthcoming from London-based Salt Publishing. She is currently editing her fourth volume of poems, Hoofer, about the imagined life of American tap legend Gregory Hines. She is also writing and quilting for The Race Quilt, a collaborative fiber arts project that creates a platform for writers to have an artistic dialogue about race in America.